The latest programmable solar array simulator power supply 62000H-S Series released by Chroma provide simulation of Voc (open circuit voltage) up to 1000V and Isc (short circuit current) up to 25A. 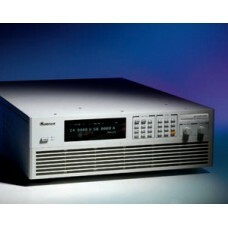 The 62000H-S provides an industry leading power density in a small 3U high package. The solar array simulator is highly stable and has a fast transient response design, which are both advantageos to MPPT performance evaluation on PV inverter devices. ect from the PV inverter. In addition, the built-in EN50530/Sandia SAS I-V model in the standalone unit can easily program the Voc, Isc, Vmp, and Imp parameters for I-V curve simulation, without a PC controller. The real solar array is influenced by various weather conditions such as irradiation, temperature, rain and shade by trees or clouds, which will affect the I-V curve output. The 62000H-S Series are capable of storing up to 100 I-V curves into the simulator memory, with a programmed time interval range of 1-15,000 seconds. It can simulate the I-V curve from the early morning to nightfall for PV inverter testing or dynamic I-V curve transient testing. The 62000H-S Ser ies have a built-in 16 bit digital control and precision voltage & current measurement circuits with a voltage accuracy of 0.05% + 0.05% F.S. and a current accuracy of 0.1% + 0.1% F.S.. It is ideal for real time MPPT analysis and tracking monitoring for PV inverters through our softpanel. The user can also enable the data recording function on the softpanel during the static MPPT performance test. When high power solar array simulation is required it is common to connect two or more power modules in parallel. The 62000H-S Series with a current range up to 25A and a voltage range up to 1000V offers a high power density envelope maximum of 15kW in a 3U package. It can easily parallel up to ten units in a Master/Slave configuration to provide 150kW with current sharing and synchronized control signals for commercial utility PV inverter (10kW ~100kW) testing. The 62000H-S Series supplies have a smart Master/Slave control mode that makes the parallel operation fast and simple. In this mode, the master scales values and downloads data to slave units so that the programming is as simple as using a standalone unit. The 62000H-S Series dc power supplies are very easy to operate from the front panel keypad or from the remote controller via USB/RS232/RS485/ APG (standard) and GPIB & Ethernet (optional). Its compact size (3U) makes it ideal for both benchtop and standard racking. Design and verify the maximum power tracking circuit and algorithm of the PV inverter. Verify the high/low limit of operating input voltage allowed for the PV inverter. Verify the high/low limit of operating input voltage allowed for the inverter's maximum power point. Verify the static maximum power point tracking efficiency of the PV inverter. Verify the maximum power point tracking performance of the inverter under different time period conditions spanning from morning to nightfall. Verify the maximum power point tracking mechanism of the inverter for the I-V curve when the solar array is shaded by clouds or trees. Simulate the I-V curve under the actual environmental temperatures within burn-in room to do inverter burn-in testing. *Requires an extra power meter. The model 62000H-S Series include a graphical user Interface software through remote digital interface (USB / GPIB / Ethernet / RS232) control. The user can easily program the I-V curve of the 62000H-S Series as well as the I-V & P-V curves for real-time testing. In addition it will display the MPPT status for the PV inverter. Readings and the report function with real-time monitoring using the softpanel are shown left. 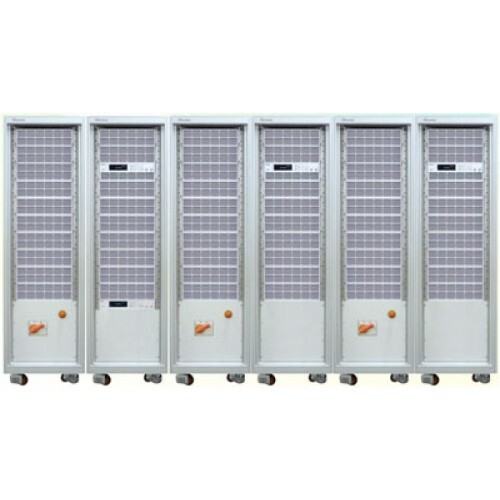 The purpose of the PV inverter is to convert the dc voltage (from solar array) to the ac power (utility). The better a PV inverter can adapt to the various irradiation & temperature conditions of sun, the more power that can be fed into the utility grid over time. So, the MPPT performance is a very important factor for PV generation system. The model 62000H-S Series are capable of simulating different types of standard crystalline, multi-crystalline and thin-film fill factor* parameters to verify the MPPT tracking algorithm mechanism and efficiency. The 62150H-600S DC power supply with solar array simulation can program the I-V curve through SAS mode and table mode via front panel or softpanel easily and up to 100 I-V curves can be stored in the unit. The user can recall the I-V curve from 62150H-600S afterwards for testing and monitoring the MPPT performance of PV inverter with the real-time tracking feature. The softpanel allows the user to set the duration for static MPPT efficiency testing. Each curve test time should be set at between 60s-600s for best MPPT efficiency performance analysis. The latest test standards EN50530, CGC/GF004 & Sandia have provided a procedure for testing patterns of the dynamic MPPT efficiency of inverters, those standards can accelerate the MPP tracking algorithm mechanism to the optimal for PV inverter manufactures. The advanced Dynamic MPPT Test function complies with EN50530, CGC/GF004, Sandia test regulations and can be controlled via the graphical softpanel by selecting CGC/GF004 or Sandia or EN50530 I-V mathematical expressions and test items. This function simulates the irradiation intensity and temperature change of the I-Vcurve under actual weather variations to test the PV inverter’s dynamic MPPT performance. The GUI will calculate the MPPT performance for analysis after running the test. A test data recording function is integrated into the software where users can edit and control the test parameters to be recorded such as voltage, current, power, watt and MPPT performance along with the sampling interval (1 - 10,000s) and total time length to facilitate the analysis and validation of the PV inverter. It has easy-to-use software to simulate the shadowed I-V curve and its dynamic change as the figure shown aside. The user can select the PV Module from the database or create individual PV module parameters for storage; and then set the amount of PV string to form a PV Array in series or parallel. Next, the user can set the irradiation, temperature, moving direction and time of dynamic shadowed change for PV Module that can simulate the cloud cover change or make Shadow I-V curve simulation for other shadow such as under the trees or the buildings. Each I-V curve is formed with maximum 4096 data points of voltage and current. The photovoltaic I-V curve model of Sandia Lab and EN50530's built in the softpanel allows the user to input the maximum dc input power (Pmax), I-V Fill Factor, Vmin, Vnom and Vmax desired to test the PV Inverter. Click the maximum power percentage value (5%, 10%, 20%, 25%, 30%, 50%, 75%, 100%) desired directly and , the softpanel will produce the tested solar cell I-V curve automatically. Next, download it to the standalone unit to start simulating the I-V curve for the PV Inverter to test the conversion efficiency. *Required an extra power meter. The real world weather simulation function allows the user to import real conditions of irradiation and temperature profiles of a whole day from excel file to Softpanel, in order to simulate the irradiation intensity and temperature level from early morning to nightfall. It can also set the interval time resolution to 1s for I-V curve update rate and enable the user to perform MPPT tracking tests under the simulation of actual weather environments. In order to easily test the static & dynamic MPPT performance of standard EN50530 & Sandia for PV inverter, the SoftPanel has an auto run function, which the user only has to set the Vmin, Vnom, Vmax, Pmax, Stabilization time &Testing period time parameter and testing items of EN50530 & Sandia, then the softpanel can run tests automatically and generate reports after finished. The softpanel also provides data recording capabilities, which include: voltage, current, power, energy and MPPT efficiency and the corresponding parameter sampling time (1s~10000s) for the recording process. The report can be utilized for R&D design characterization verification, QA verification and production quality control. When high power is required, it is common to connect two or more power supplies in parallel. The 62000H series supplies have a smart master / slave control mode making the parallel operation fast and simple. In this mode, the master scales values and downloads data to slave units with a high speed sync signal process and automatic current sharing control.